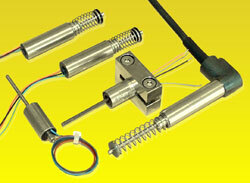 by Admin.In Encoders, Miscellaneous, Position, Potentiometers, Principals, Resolvers. 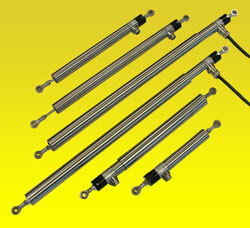 Inductive Linear Transducers for engineering and instrumentation. The half-bridge technology for 1 to 360 mm stroke. The wide range of inductive linear transducers includes items with 10, 12 and 25 mm outside diameter and for measuring ranges from 1 to 360 mm. The smaller IW 10 and IW 120 series require external electronic modules for excitation and signal conditioning. IW 250 series with 25 mm housings have integral electronics consisting of oscillator, demodulater and amplifier. Analogue output signals are either 0(4) to 20 mA, 0 to 10 VDC or ± 10 VDC for full range or calibrated strokes. The transducers are completely potted to meet protection grades up to IP 68. Electrical connection is made either by leads, plug and socket or through cable glands. Various mechanical configurations are available to suit specific mounting conditions. The IW 260 displacement transducers operate according to the new principle of fractional inductivity allotment within the hollow coil. Depending on the position of the core the inductivity changes within the corresponding coil section. This kind of layout provides for more position data than the classical half-bridge or LVDT configuration. An integral electronic circuit transforms these data into a signal proportional to the displacement of the plunger core. The electronic circuit contains an oscillator, a demodulator, an amplifier and in some cases a current output source. Its SMD-design is short-circuit proof and protected against reverse polarity. The sensor system is completely sealed within a non-corrosive steel case to ensure positive protection against vibration, shock, humidity, oil and corrosive matter. The new principle of fractional inductivity allotment as described above brings about an outstanding increase of the measuring stroke. In comparison to the IW 250 model the useful range of the IW 260 model increases by 70 to 100% based on the same length of the case.